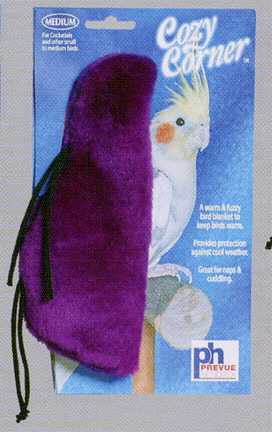 Prevue Cozy Corner Bird Tents, 6, 8, Or 12 Inches. These are soft, cuddly bird tents, or you might call them Snuggles. Tie them to the cage bars where your pet feathered friend can cuddle, nap, or play. 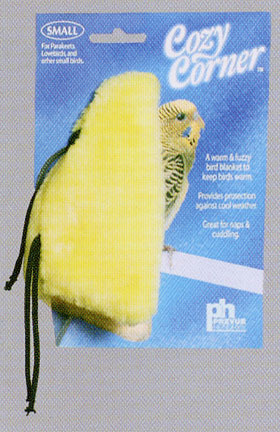 Works well in the corner of the cage over a perch. PRE1160 (6 Inches, great for Parakeets and other small birds). 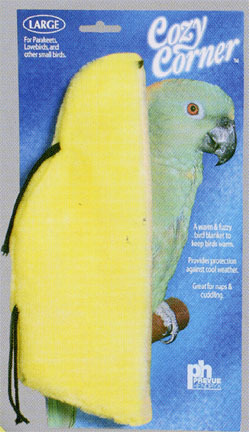 PRE1161 (8 Inches, great for Cockatiels and Other small to medium birds). PRE1162 (12 Inches, great for small parrots and other medium birds).